Yet another rainy day. Kinda dreary. I don't really feel like doing anything. I may just sit in front of the TV and eat the rest of these cookies I made yesterday. I used the Cherry Cordial M&M's that were out during the Christmas season. They taste exactly like the Cherry M&M's I used last year to make my Dark Chocolate Cherry M&M Cookies. Although I haven't look for the Cherry ones this year, I know they are usually out for Valentine's day. So either one you use is good. But you gotta have the cherry flavor in there. 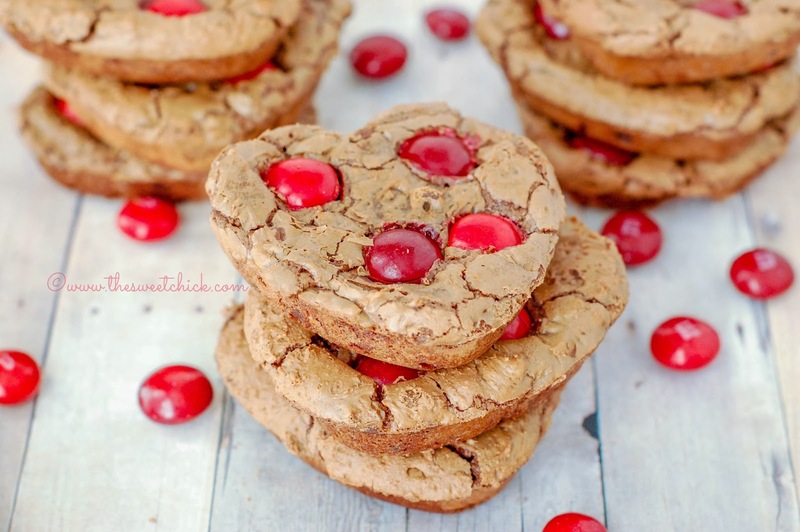 When I was scouring the web for a soft, chewy chocolate cookie recipe to use with these Cherry Cordial M&M's, I came upon this recipe for Soft and Chewy Brownie Cookies from Averie Cooks. 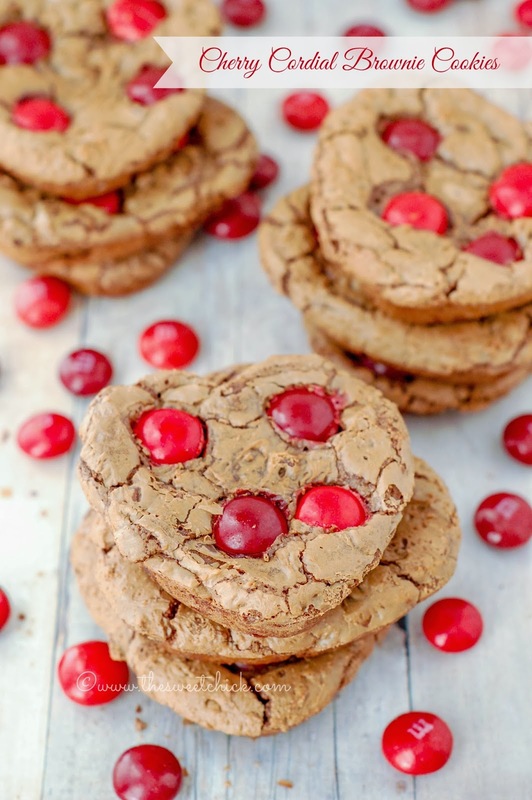 Averie has some fabulous cookie recipes and her food photography always leaves me drooling. Now I know she says not to use chocolate chips in this recipe because they do not melt well in the microwave, but I used Ghirardelli Baking Chips which I already know melt very well in the microwave. And they taste amazing. Since I needed 12 oz. of chocolate and the baking chips come in a 10 oz. bag, I added some mini chocolate chips to make up the difference and bridge the way between the dark chocolate baking chips and the milk chocolate M&M's. What intrigued me about this recipe besides the minimal amount of flour, was the fact that you need to leave the batter out at room temperature for 1-2 hours prior to baking. I though this was odd. Usually you put it in the fridge. But, hey, I am always up for something new. I left the covered batter out for about 1 1/2 hours to set. You have to let the cookies cool completely before trying to remove them from the pan or they will fall apart on you (and you will have to eat them). I think I may have overfilled my pan a bit, but they still came out heart shaped. I tasted one while is was still warm and the gooey chocolate was to die for. Once cooled, the cookies have a slightly crispy outside with a soft, chewy inside just like a brownie. Since I used the baking chips which are larger than regular chocolate chips, you also get some nice chunks of dark chocolate when you bite into the cookie. The Cherry Cordial M&M's just heighten the chocolate experience. 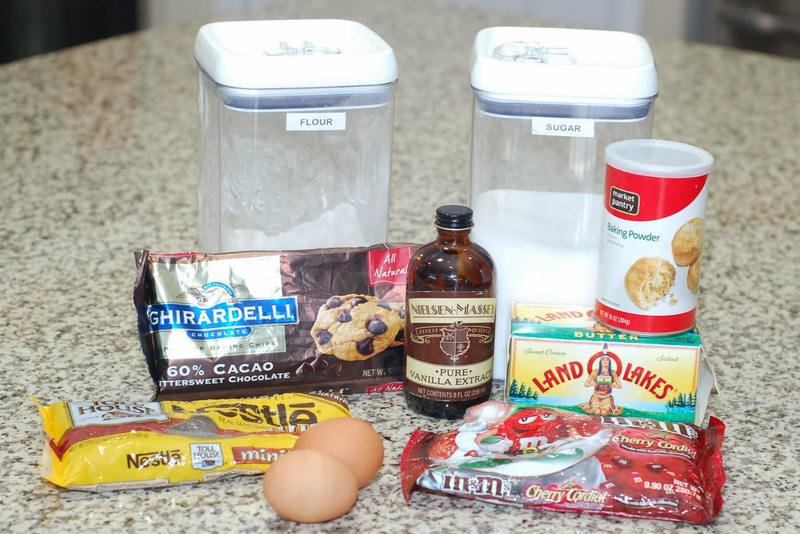 I may try just mixing them right in the batter next time to add even more cherry flavor. I have never made brownies from scratch before, never mind brownie cookies. I am so excited they came out right. I hope you enjoy them as much as I do. Place 5 oz. of the Ghirardelli baking chips in a small microwave safe bowl or measuring cup with the butter. Microwave at 30 second intervals until completely melted and smooth when stirred. Set aside to cool. In a stand mixer add eggs, sugar and vanilla. 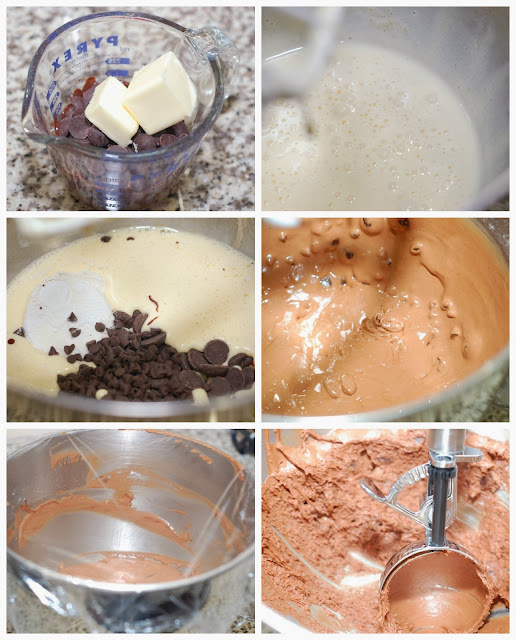 Mix on medium for about 8 minutes or until mixture is a pale, creamy texture. 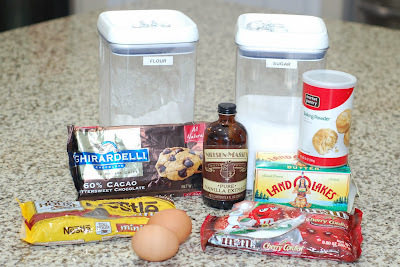 Add the flour, baking powder, melted chocolate, remaining 5 oz. 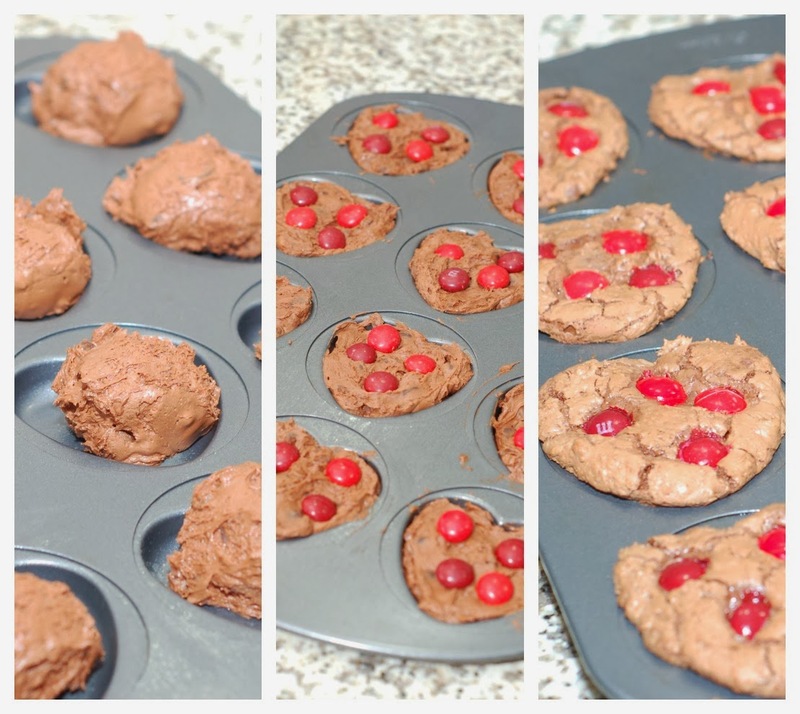 of baking chips, and the mini chocolate chips to the egg mixture. Mix on medium for about 1 minute until fully combined. Once mixture is set, preheat oven to 350°F. With a large scoop (a little less than full), fill each cavity of the whoopie pie pan. With a spatula, spread the batter out to fill the shape of the cavity. Gently press 3-5 M&M's into each shape. Bake for 10 minutes each batch. Do not remove from pan. Leave in pan until completely cooled, then gently remove with a clean spatula. Grab yourself a cup of coffee or milk and sit down with your cookie. 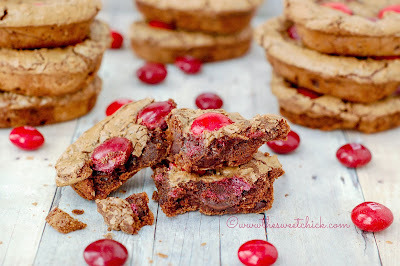 You are going to want to savor each minute of this dark chocolate and cherry bliss! Carole, these sound so good. As soon as I saw that you had shared these at Treasure Box Tuesday, I couldn't wait to come over here and check them out! SO perfect for Valentine's: hearts and chocolate! 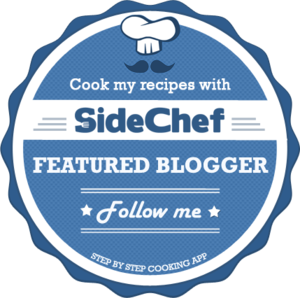 ♥ Pinned! Thanks Joy, I am glad to join the party! This looks really good; now would you put bread in the container once you put the cookies in there to keep them soft or is that not necessary because of it being of a brownie consistency? I didn't put any bread and they were fine. You want them to be moist. 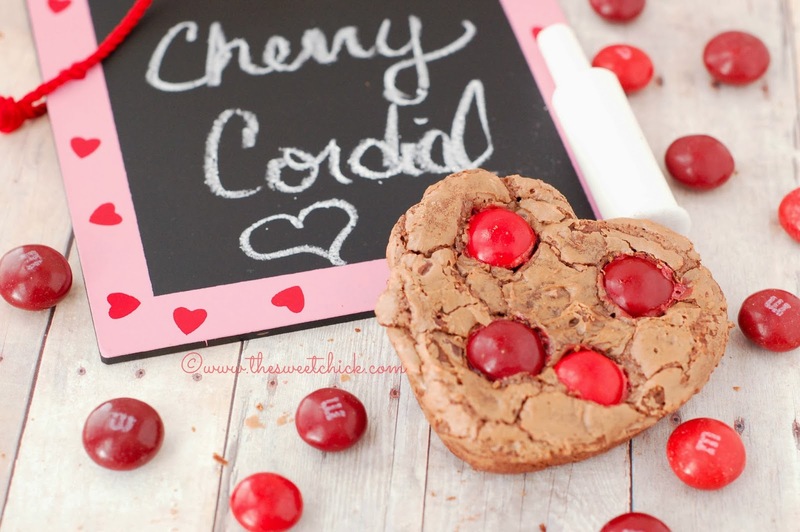 I adore anything that's Cherry Cordial, so I can't wait to try this recipe!